Livius states that Alexander visits Memphis in January 331 B.C. The Landmark Arrian Arrian makes no mention of Mazeus surrendering the city (he has the Babylonians in general surrendering it). I recently created a Tumblr page for The Second Achilles. As well as being a place to reblog pictures of the great man himself I also use the page to reblog other classically related pictures and pictures that really have no place there but which I like anyway. For example, a few days ago, I found a still from one of my favourite films – Fried Green Tomatoes at the Whistlestop Café. No connection to ancient Greece at all (that I can think of, anyway) but I wasn’t going to miss an opportunity to reblog it, anyway. The following detail comes from Tumblr. It is a detail from Caravaggio’s Judith Beheading Holofernes. I was immediately struck by Judith’s expression. Her brow is furrowed, she is concerned; indeed, it feels like she is ageing ten years before our very eyes. And no wonder for at this moment she is cutting Holofernes’ head off. What I don’t see in this detail is fear or regret. There is a steeliness in her face, a determination to see her deadly job through. The reason why the close up of Judith jumped out at me is because it tangentially recalled to mind a moment from Michael Wood’s documentary on Alexander (2005). In the first episode, he visits an (unnamed) Greek archaeologist who shows him a little carving of the nineteen or twenty year old Alexander’s head, which was found on a banqueting couch in Philip II’s tomb. Wood says he has a ‘sensitive face’ and compares it to a bust of the thirty year old Alexander who looks like ‘a troubled man’. If you would like to watch the sequence, it begins at 6:47 in the video below. I suppose the reason why Caravaggio’s painting reminded me of the carving and sculpture of Alexander is because of the way he, Alexander, goes from being young and carefree in the former to old and worn in the latter. 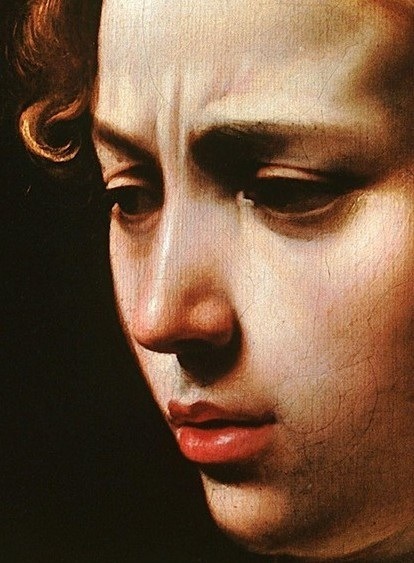 By contrast, Caravaggio manages to achieve a broad range of emotion in just the one image. And he makes Judith look so beautiful as well! It would be unfair to say that this makes the Italian a better artist than Alexander’s sculptors. They were, no doubt, working to very different rules than Caravaggio but the detail happily reminds me of why Caravaggio is such a great artist and makes me now want to go and look at some of his other paintings again. On a personal note – I first read Judith’s story when I studied the Anglo-Saxon poem at university. It stayed in my mind because the poet calls refers to Judith as ‘ælfscinu’ – elf shining – which (I am trusting to memory here) given that the Anglo-Saxons were not keen on elves and elvish things seemed an odd choice of word to use. Perhaps by the time the poet (Cynewulf) wrote his poem ælfscinu had changed its meaning?